Gradually beat in just enough remaining milk to make frosting smooth and spreadable. If frosting is too thick, beat in more milk, a few drops at a time. If frosting becomes too thin, beat in a small amount of powdered sugar. Frosts 13x9-inch cake generously, or fills and frosts an 8- or 9-inch two-layer cake. Use a real vanilla; imitations are not recommended. If you can find a vanilla bean paste it’s well worth the investment. The role of vanilla is not only for its flavor value, it also enhances the sweetness of the sugar, so bumping up the vanilla allows you to decrease the amount of sugar in recipes. Allow your butter to soften at room temperature so it easily beats up smoothly with the powdered (sometimes called confectioner’s) sugar. Boost the amount of butter to as much as 3/4 cup for a rich, decedent frosting and use an unsalted butter if you like. A real buttercream frosting takes little time to make, can be tinted with food coloring (use paste or gel, not liquid food color), and will hold for several weeks if tightly covered. It’s easy to vary the flavor of this core recipe: stir in a dash of almond extract, grated citrus zest, or a little bit of edible lavender buds. Adding finely chopped fresh rosemary is incredible on a lemon pound cake. Four simple ingredients—sugar, butter, vanilla and milk—come together in a homemade frosting recipe that proves the whole is greater than the sum of its parts. Hundreds of home cooks and bakers have used this recipe for decorating cakes, filling layer cakes or topping off a pan of brownies. 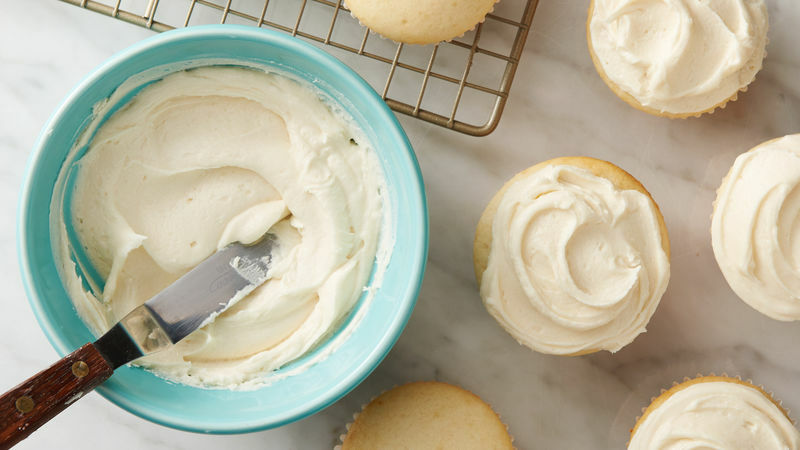 Before you begin, check out this step-by-step tutorial on making frosting. You’ll learn that a perfect buttercream frosting recipe starts with room-temperature butter that can still hold its shape but is starting to soften at the edges. Test it by pressing a finger into the butter; if it gives and your finger leaves an indent, it’s ready to go. Once you’ve mastered vanilla buttercream frosting, expand your skill set with more frosting recipes.